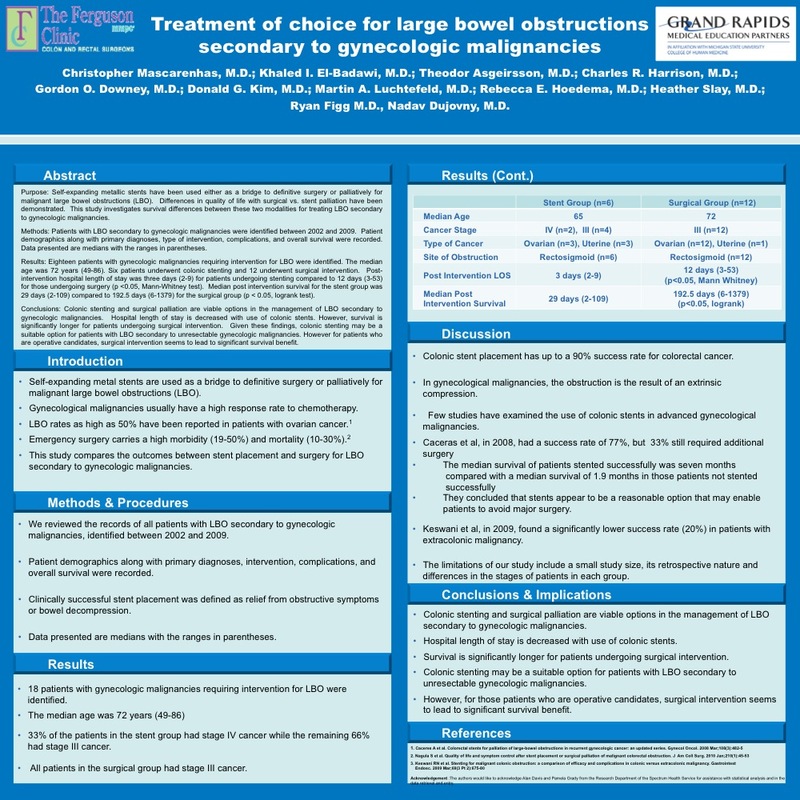 bridge to definitive surgery or palliatively for malignant large bowel obstructions (LBO). Differences in quality of life with surgical vs stent palliation have been demonstrated. This study investigates survival differences between these two modalities for treating LBO secondary to gynecologic malignancies. Methods : Patients with LBO secondary to gynecologic malignancies were identified between 2002 and 2009. Patient demographics along with primary diagnoses, type of intervention, complications, and overall survival were recorded. Data presented are medians with the ranges in parentheses. Results: Eighteen patients with gynecologic malignancies requiring intervention for LBO were identified. The median age was 72 years (49-86). Six patients underwent colonic stenting and 12 underwent surgical intervention. Post-intervention hospital length of stay was three days (2-9) for patients undergoing stenting compared to 12 days (3-53) for those undergoing surgery (p <0.05, Mann-Whitney test). Median post intervention survival for the stent group was 29 days (2-109) compared to 192.5 days (6-1379) for the surgical group (p < 0.05, logrank test). malignancies. Hospital length of stay is decreased with use of colonic stents. However, survival is significantly longer for patients undergoing surgical intervention. Given these findings, colonic stenting may be a suitable option for patients with LBO secondary to unresectable gynecologic malignancies. However for patients who are operative candidates, surgical intervention seems to lead to significant survival benefit.